"When you are trying to leave van pelt and have gotten all packed up, juggling a bag full of books, it is BEYOND FRUSTRATING to take it off your shoulder and open it and then try to close it again as you are walking out, things falling out all over the place and a line building up behind you. 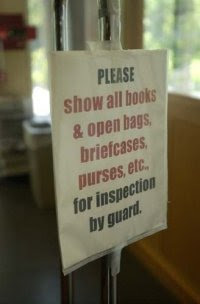 And yet the security makes the smallest effort to peer over the desk and tell you to keep going without actually looking at a single thing in your bag. if they aren't going to look WHY DO WE HAVE TO OPEN IT! This is an ode to the most pointless and frustrating rule ever." I'm sure this dreaded requirement has been around for decades! I remember how irritated I'd get for having to do this. Do any of you have any funny stories related to this? Comment below! Click here to join this group! Speaking of Facebook, have you checked out my Top 5 "Penn" Facebook widgets? For my "Now and Then Thursdays" series, I wanted to share one of my most favorite films I created back in 1996 about an obsessed woman who stops at nothing to find her man. Her man happens to be Waldo from the popular children's book series and finding him on Penn's campus may be a little tricker than she hoped. Parts of this video were taken during the 1996 Hey Day and Penn Relays. 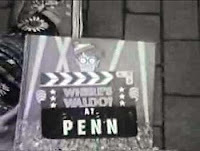 It's interesting to note that the same fun and craziness existed back in 1996 as the fun and craziness you'll see in the videos from Hey Day 2007 as well as the 2005 Penn Relays. Watch my other 1996 videos: "Love on the Go" and "Stacked Competition"
The Simpsons sitcom writer Matt Selman (C'93) finally got Penn into primetime! Check out the "Button" in the background of one of the shots from his episode, "That '90s Show" (see image above). The episode aired a few weeks go, but will rerun in the next few months. In the meantime, watch it online here!